Preheat oven to 350°F. Place almonds in a single layer on a baking sheet and bake 10-15 minutes until toasted. Meanwhile, in a small bowl, combine olive oil, lemon juice, salt and pepper. Set aside. Cut the tops off zucchini and shave in long, wide strips using a vegetable or Y peeler. Place shavings in a large bowl, and pour in olive oil mixture. Toss to coat and set aside. Remove almonds from oven and immediately toss into salad. Serve salad topped with shaved slices of Parmesan cheese. I’ve never been much of a salad person. Give me potato salad or pasta salad any day, but a plain ol’ green salad with vegetables and dressing? I’ll pass. It just doesn’t whet my appetite. This Shaved Zucchini Salad, though, is different. Sure, it’s still got veggies and dressing, but the difference is the flavor – it’s packed with it. Whereas a normal vegetable salad is covered with dressing on the top, leaving the bottom half plain and flavorless, this salad is tossed in a dressing that coats every last bite. Plus, you don’t have to pick and choose which vegetable you’ll put on your fork each time – each forkful is filled with the same unique flavor combination of fresh zucchini, toasted almonds and salty Parmesan cheese. What I like most about this recipe is how simple it is to make. In less than 20 minutes, you can have a gourmet salad on your dinner table. It’s great as a side salad to a light summer meal or as a lunch by itself. The mixture of dynamic tastes and textures between the crunchy, ribbon-sliced zucchini, soft Parmesan cheese, zesty lemon juice and crisp toasted almonds will leave your guests – and your taste buds – asking for more. Thankfully, this recipe takes less time than it does to watch your favorite TV show, so you can make it again and again without breaking a sweat (bonus: No oven required! That’s a good thing in sweltering summer heat). 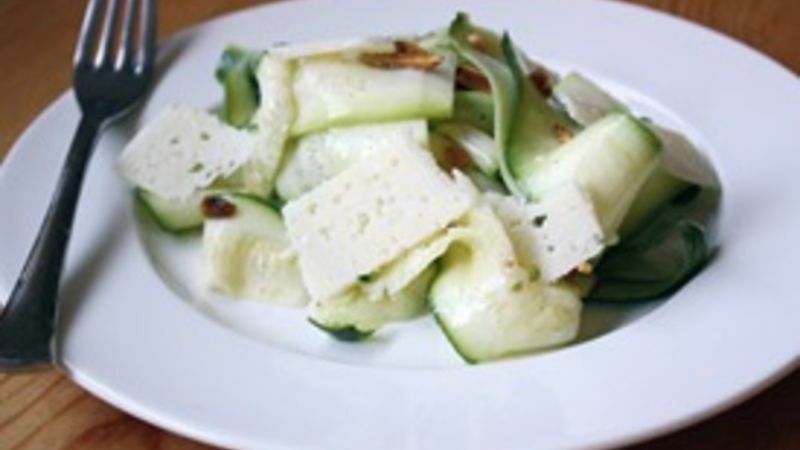 So next time you’re planning to make a salad, ditch the lettuce standby and try this effortless Shaved Zucchini Salad!